May buy 1 for yourself and 1 additional as a gift. May redeem 1 per person. Must sign waiver. Consultation required; non-candidates and other refund requests will be honored before service provided. Appointment required, 24 hour advance notice required. Valid only for option purchased. Expires 4 months after purchase. See the terms that apply to all deals. 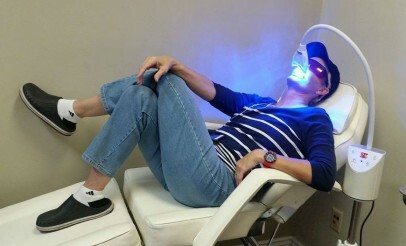 A Whiter Shade's comfortable studio allows you to relax and enjoy your teeth whitening treatment. During the session a top-of-the-line whitening gel is used, followed by a LED light to achieve a brighter, beautiful smile. A Whiter Shade offers comfortable, in-office teeth whitening sessions that are approximately 50-minutes long. They guarantee results or you'll get your treatment for free!